I believe that necessity is the mother of invention. Propagating succulents is fun and easy but sometimes the appropriate planter can be costly. Last spring my succulents needed some place to grow so I enlisted my husband to make some mini boxes for me. He used pieces of wood that were available around the house. When he had cut the wood into the right pieces, my nine-year-old daughter helped him nail the pieces together. After a couple of months later... They don't look shabby at all. In fact I favor them because they are low cost and they deviate from the mass-produced look. The grayish color of the faded wood complements the bluish-green succulents. The plants seem to like the box. These pots are light and easy to move around. The box can be made long to hold more plants. My nine-year-old daughter made this box which seem to be holding together...a little bit. These planters are so easy - even a nine-year-old can make them. Aided by the air movement this tendril will soon touch the wire. I have been closely monitoring the growth and behavior of the two bottle gourds (Lagenaria siceraria) plants in my garden because I'm curious as to how they would behave in this climate. Although my growing-up years involved eating its fruits and playing under the shade of its broad leaves on overhead-trellises so far I have not grown it in my California garden. Now I get to appreciate those plant characteristics that I took for granted in my younger days. Tendril is one of the special features of this plant that I came to appreciate. Technically speaking, tendril is a modified plant organ. Everyone knows that the basic plant has roots, stems, leaves, branches, fruits and flowers. Depending on the nature or original habitat of the plant, one or more of these basic plant organs take on a modified form. The bottle gourd is a plant of the tropics where the vegetation is dense that plants continually fight for a favorable position in relation to available sunlight. Some plants which are not structurally equipped to stand tall have developed tendrils for support. This is called adaptation. One fictional example of this phenomenon is demonstrated in the movie "Waterworld" where Mariner (played by Kevin Costner) developed gills because his world was the water. The tendril is sensitive to contact - this is called thigmotropism. Any solid object that comes in contact the tendril serves as a stimulus to the direction of its growth. Tendrils tend to consistently follow a clockwise or counterclockwise direction. The tendril of the bottle gourd (a cucurbita) could be a modified shoot. It grows from the node where a leaf, flower and another branch normally appear. The tendril being a shoot eventually breaks into lateral branches as demonstrated by more than one tendril coming one original growth from the node. The springy tendrils brace the plant close to the solid support. Have you any plants with tendrils growing in your garden? I'm back in the garden! Last week my family went on a road tour of universities in California (which explains my inconsistency on my blog posts recently). Now we are back and happy to find out that my garden is in great condition. Thanks to my sixteen-year-old daughter who made sure that the drip system was working well before we left and my neighbor who came during the week and gave the plants a cool-treat by watering during those triple-digit-days. When the temperatures are high and water is not limiting plants usually grow very fast. My youngest child noted that the fig tree in the corner of the yard grew almost a foot while we were gone. Same thing is true for the bottle gourd. A colorful basket of vegetables from my kitchen garden. Although I asked my friend to harvest from my garden, there was still a lot of food that needed to be brought in. They need to be harvested so that the plants can continue producing. Those tomatoes are very sweet. This afternoon we grilled some summer squash and they were great. The basil plants are still green and growing with some flowers every now and then but I keep pinching them off. Have you ever wondered why some tomatoes are cracked? It is not caused by a disease. Instead, it happens when the amount of water available to the plant is inconsistent. When the soil is allowed to get close to dry followed by over-watering can cause the plants to absorb more water than the cells can contain. As a result the tissues break like this one in the picture. This happens to potatoes also. In any case, the vegetables are still edible. The only negative effect is on the appearance. In commercial scale farming, this would be detrimental on the marketability of the produce. Solution - Consistent watering schedule. The sweetest tomatoes are those that ripened under the sun. We visited Filoli on our way home from that long road trip we took to Southern California. We toured several universities and for a break we decided to treat ourselves to something different. The tour of Filoli includes a house and a garden tour but we stayed in the gardens during the whole time. We skipped the part of the tour that focused on the opulence of the people who lived in that magnificent house. It is interesting and relaxing to appreciate the verdant gardens; the delight of discovering a new garden room at every gate; the various horticultural techniques that shaped the different trees and shrubs; and the brilliance behind the choice of the different colors and shapes of plants in every corner of the garden. Filoli Center is located in Woodside near San Francisco. The place is bay-influenced and thus the weather is mild. The good thing about the place is that it is so close to the city and yet when you are there is the feeling of being so detached from the busyness of the urban life. There is a great history behind the house and the garden but a tiny glimpse of that history can be extrapolated from the origin of the name of the property Fi-Lo-Li. The original owner had this for a credo: "Fight for a cause; Love your fellow man; Live a good life." The name was derived by combining the first two letters of the key words of the phrase. If you happen to be near San Francisco and wondering where to go...I strongly recommend Filoli. 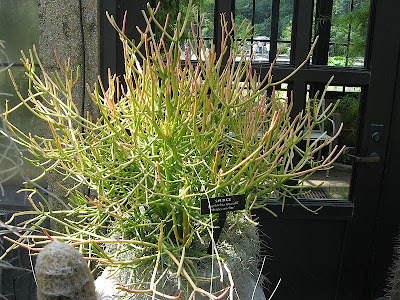 The plant Euphorbia tirucalli recently sent Pastor Rick Warren to the emergency room. Read the article that describes what happened. If you happen to have this in your garden or will come close to this plant in the future - be informed that this plant can be dangerous if it is made to "bleed". Inside the stick-like branches is corrosive and extremely toxic milky sap. It can cause severe pain and detrimental effects on the skin and eyes on contact and fatal when ingested. I would say that this is not safe to have around children. If you really want to have it in your garden, take extra precaution when handling it. Beauty is deceptive. Get to know the plants in your garden. During the last five days, I've been away from my normal gardening. We (my family) are on a college tour visiting different universities to help my daughter make a choice where to study. My garden is left at the mercy of my dependable automatic irrigation system. I'm hoping that no animal would chew on the drip lines as they have done in the past. Castroville, The Artichoke capital of the world. Truly, California is highly a world class agricultural state. 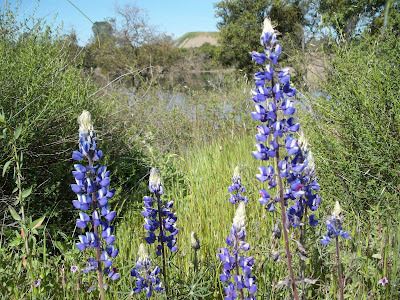 On one of my walks with my family, we noticed so many butterflies in meadow along the American River. They were attracted to the flowers. We sat there and watched them and tried to take pictures. However the sun was so bright that it was challenging to take good pictures. I wondered what attracted the butterflies to that place. There are basic requirements for butterflies to like a place. 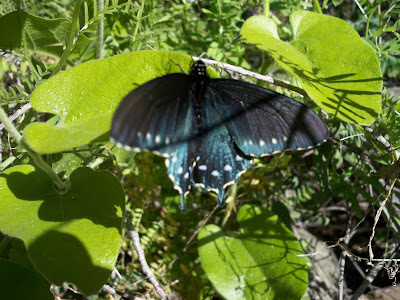 Just like most living organism butterflies need the following: water food and shelter. 4. Provide a sheltered spot using windbreak or wind blocks. 5. Create a garden well away from traffic. 6. Provide a full sunny spots for warmth. 8. Plant a variety of plants to include cluster and single blooms. 9. Plan and plant for successive blooms throughout the season. This season, there is a succession of insectary plants serving the pollinators in my kitchen garden. For this year it started with the biennial flat leaf parsley. Then there were the annuals such as cilantro, bok choy, radishes. Currently, the Greek oregano plants are flowering and they are like haven for bees. Early in the morning bees swarm the flowers and they eat nectar all day long until dusk. Greek oregano is a drought tolerant perennial plant that grows up to 60 cm. tall. It blooms profusely from July to September with white flowers that attract bees indicating a considerable level of honey potential. Its small oval-shaped leaves are aromatic which made it an important culinary herb particularly in Italian cooking. Origanum vulgare has white flowers. For the bees, the plant is a source of food - nectar. Plant one in your garden today to lure the pollinators to visit your garden regularly. It is that time of the year again when being in the garden is almost like being in a furnace. Plants love the sun. Plants are plants because of the sun and the heat energy they derive from it. To most plants summer is heaven. In addition to the abundance of sunshine, temperature also increases the rate of photosynthesis or production. That's what plants love to do. But anything good especially in excess always comes with a price. Intense sunlight which is accompanied by high temperatures jeopardizes the availability of water to the plant. Ground water dissipates from the ground through evaporation while absorbed water escapes the plants through transpiration at a high rate. Ideally, natural weather conditions would provide replacement of lost water through precipitation. My garden is not so ideally located when it comes to rainfall. 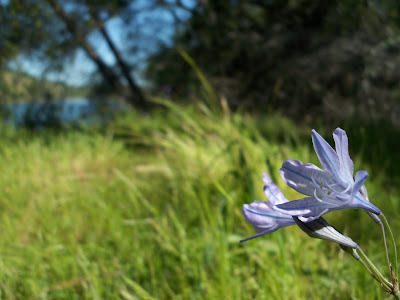 Affected by the Mediterranean climate, California's subtropical environment is characterized by a dry summer. The example of weather condition above shows how dry it is here by the relative humidity of lower than 20%. Gardening here requires some techniques to beat the heat during the dry months. 1. Water less frequently but deeply to encourage the roots to grow deeper. 2. Water during the cooler times of the day/night to avoid loss by evaporation. 3. Drip irrigate to avoid runoff especially where the soil is on a slope. 4. Check irrigation pipes for leaks and breakage. Mulching is the simply the process of spreading a protective layer of material on top of the soil. It is an effective way to conserve soil moisture, reduce soil temperature, and prevent weed growth. There are several materials available at your local nursery or home improvement center. When using organic materials (those that are derived from plant and animal by-products) mulching eventually improves the water-holding capacity of the soil. Use what is available and free. In my garden I use dried grass clippings for mulching instead of throwing them away. It has to be dry before they are used to mulch shallow rooted plants but you can directly use fresh clippings to mulch around trees or in opens spaces. Coffee grounds also make a good mulch material; I use them for mulching potted plants. Coffee shops such as Starbucks and Peets Coffee offer coffee grounds for free. Sometimes they already in bags ready for anyone interested. Potted plants are "caged" and they have limited space to hunt for resources particularly water. During the hot months of summer, it is best to move them to a place where they can get some shade. This will reduce water loss through excessive transpiration and evaporation. Frequent watering depletes the soil from the essential nutrients especially those in pots. Applying fertilizer on a regular basis benefits the plants. It is not enough to provide water for the plants. The nutrients they need have to be available also for continued growth and development. The potted orange trees in my yard are great examples. After a couple of months into the warmer months, the leaves show signs of yellowing which is a symptom of nitrogen deficiency. A little bit of complete fertilizer quickly restores the nice green coloration of the leaves. Summer gardening is fun as long as we beat the effects of high temperatures. This morning when I went out to water my plants I saw these unique flowers coming out from the Sempervivum spp. (a.k.a. hen-and-chicks). They are not very obvious because they are rather tiny. However, with a little bit of magnification anyone can see the intricate details of these dainty flowers. When the flowers are unopened, grayish green sepals wrap around baby-pink petals. As the petals unfurl, reddish pink color is revealed in a star-like shape. Red stamens with yellow tips stick out from the center. The name sempervivum means ever-living (semper meaning always and vivere meaning to live). So far they have proven to be ever-living in my garden. Various succulents in one pot. Notice the tiny flowers hanging. Sometimes the most beautiful things come in small packages. One out of three. Driven by nostalgia I planted some tropical vegetables (the ones I used to eat in the Philippines) last spring. I planted three kinds of plants bitter melon (Momordica charantia), luffa (Luffa acutangula), and bottle gourd (Lagenaria siceraria). Only the bottle gourd or as it is called in the Philippines Upo, emerged. Out of the twenty seeds I planted only two made it to become plants. One of them is in the middle of the vegetable garden and the other one is growing against the fence (see picture). Uses. The mature bottle gourd is often used for decorative and craft-making purposes. However, in most Asian countries, it is an important vegetable crop. The fruits are harvested when they are young and tender. With a delicate flavor, they make good additions to stir-fries and soups. Special treatment. Take note of the mulching material I used - dry avocado leaves. Instead of throwing away, pile them around plants. The leaves of bottle gourds are wide hence, it is expected that the rate of transpiration is high. Mulching helps conserve soil moisture and also prevent weeds from growing. Have you tried eating bottle gourd before? 'Lipstick' is an ornamental strawberry with flowers that bear the color of guess what? Answer: A beautiful dark pink worthy to be a lipstick color. Although this flower is named by the attributes of its petals I can't resist mentioning about its other parts. 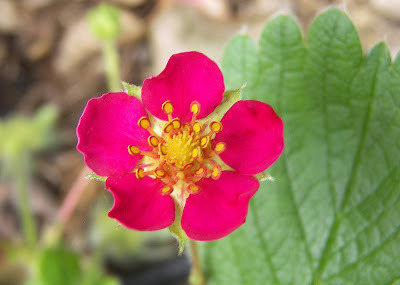 Apart from the color, this flower is representative of the other strawberry varieties. It has five petals and five sepals seen in between the petals from the top view. The tiny spoon-like structures are the stamens. In the center is yellow sponge-like gynoecium (ancient Greek gyne meaning woman; and oikos meaning house) which is made us of many free carpels. In other words the sponge-like center is the female part of the flower. Chives (Allium schoenoprasum): Reproductive stage. At this time of the year, chives shift growth and development from vegetative to reproductive phase. Flowers develop and then seeds follow. Although the flowers are very ornamental with lavender color, the plants stop producing leaves when their flowers come out. The young flowers are edible and make good additions to salads. 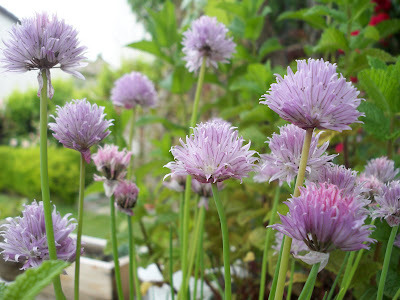 However, if you want the chives to continue producing green parts, trick the plant into thinking that flowering is over by trimming it down to remove the developing seeds. It is best to remove or trim the flowers off on or before they start to fade. This not only encourages renewed vegetative growth but it also prevents the spread of chives seeds all over the yard. They can become perennial weeds if allowed to disperse in places where they are not welcome to grow. If your herb is planted in a pot, apply a small amount of complete fertilizer to replenish the nutrients that got washed out by frequent watering. The chives were cut very close to the soil - about one inch was left. Ten days after cutting back: Vegetative stage. Trim your chives for a continuous supply of this aromatic herb. 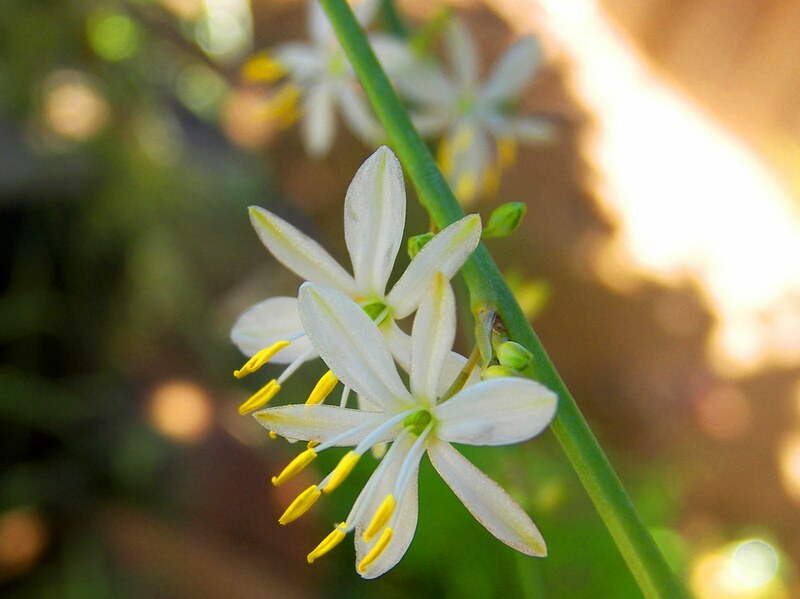 Prominent stamens on Spider Plant (Chlorophytum comosum) flowers. The details of the Spider-plant flowers are often unappreciated for several reasons. First of all they are very tiny to appreciate and their color shows no contrast against the leaves of the variegated spider plant ('Variegatum'). With the use of a camera, we can all appreciate these miniature flowers. The flower is well designed for pollination; the pistil which is the long white structure coming out of the green center (which is the ovary) extends out to the same distance as the stamens which are identified by their yellow color. No wonder whenever the spider plant is allowed to flower, it reseeds profusely. Spider plant is a common houseplant and a very ideal plant for the shady areas outdoors. It requires low maintenance that it is impossible to kill it. They have specialized roots that allows them to store water. That is why it can withstand prolonged periods of dry spells. Nitrogen-Fixing. Beans, just like most leguminous plants, indirectly improve soil fertility. Legumes are easy to identify - they have seed that are encased in pods. They are hosts to the nitrogen-fixing soil bacteria called rhizobia. Rhizobia are different from the rest of the soil microorganisms because they have the ability to fix nitrogen. They infect the roots of legume plants as indicated by the presence of root nodules. While they are in the plant they catch nitrogen molecules from the air and transform that into a form that is available for plant use. Sometimes, gardeners and farmers inoculate the seeds before planting to ensure that nitrogen-fixation occurs. This week we harvested a handful of pods enough to provide the vegetables for one meal. Inspired by the produce I got from my garden, here's a recipe I made. You are welcome to try it and modify depending on what's available from your own garden. Green Bean/Potato Salad with Left-over steak. Whisk oil and vinegar together. Add to the rest of the vegetables and toss. Add salt and pepper according to desired taste. Happy Fourth of July everyone! My family just got back from watching the fireworks at the El Dorado Hills Town Center to celebrate the declaration of independence of this country from Britain. It was then when democracy was born. In July 4, 1776 the American flag, known as the red-white-and-blue, flew alone. Rosa 'Fourth Of July'. 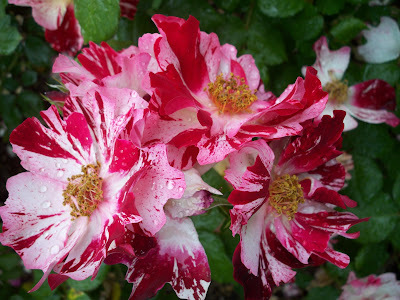 There is a rose named after this eventful day because of its explosion of red/white color. The flowers are composed of 15-petals with fruity fragrance. The leaves are glossy dark green that are quite resistant to diseases. This climbing rose was winner of the coveted ARRS award in 1999. 'Fourth Of July' in my garden. Although this rose is climbing in nature, the one in my garden is a standard rose - it looks like a tree because of the way it was grafted. It did very well in full sun but I moved it last year in order to open up a space in the grass area. Now this rose grows along the southern fence where it gets a lot of the afternoon sun. It is doing considerably fine but not as vigorous as when it was getting both morning and afternoon sun. It could also be that it is just taking some time to get re-established in this new place. 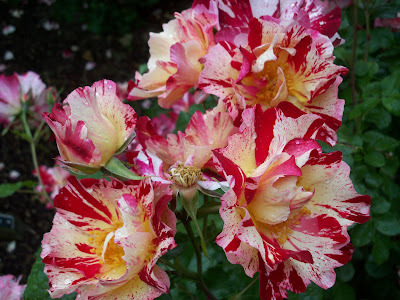 'Fourth Of July' rose: Red and white stripes with yellow center. June 28, 2010 - First sign of emergence. June 29, 2010 - The plumule is out and starting to unbend. June 30, 2010 - The first set of true leaves finds light. July 1, 2010 - The plumule now turns to a stem as the second set of leaves is beginning to differentiate. After almost a month since the mango seeds were planted, the first sign of life emerges. The wait was long considering that the seed was already germinating when planted. The radicle which is the part of the seed that would grow downwards to become the main root was visibly elongating. Yet, it still took almost a month for the plumule (which is the part of the embryo that would grow upward) to find its way into the light. This seedling has a lot of growing and differentiating to do. It will be interesting to see how this tropical plant performs in this semi-arid temperate zone. Although it is not much of a tree, it is the first of its kind that I have seen in California. Experiment in your garden and learn something new.